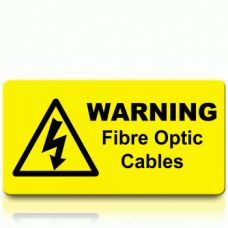 Warning Fibre Optic Cable Labels are required to clearly indicate the potential electrical hazard. Printed Black on Yellow, our Warning Fibre Optic Cable Labels are highly visible and should be applied to all installations and work involving fibre optic cables. To achieve best results please apply our Warning Fibre Optic Cable Labels to a clean, flat and smooth surface.